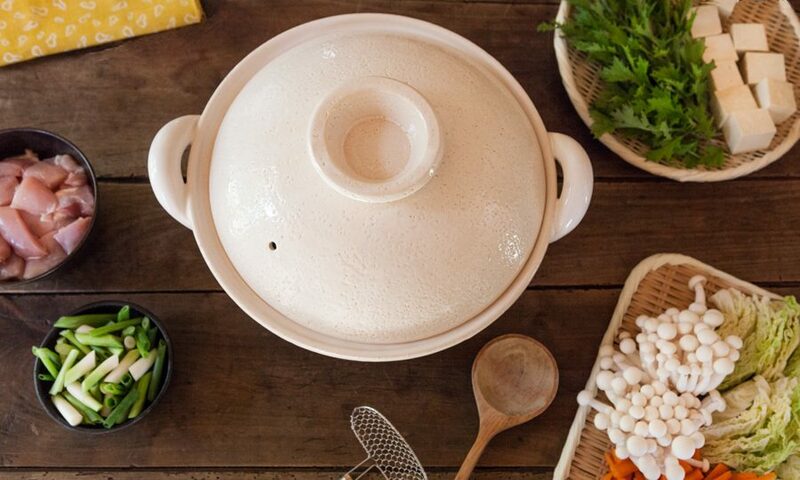 The donabe, a traditional Japanese clay pot, is one of our favorite cooking vessels. We’re clearly not alone. Archaeologists date these versatile cooking vessels to 10,000 years ago. We source our donabes from the venerable Nagatani-en clayware house, founded in 1832 and the leading producer of Iga-yaki pottery. Each donabe takes two weeks to complete and is an artisanal piece of work unto itself. Sourced from an ancient lakebed that contains millions of tiny fossils, Iga’s clay is naturally porous with a rough surface that distributes air flow and can withstand high heat efficiently. Here are just a few of our favorite donabes. To inspire, we also offer a Chicken Hot Pot recipe adapted from the book Donabe, (co-authored by our friends Naoko Takei Moore and chef Kyle Connaughton) to pair with it. This classic-style donabe has found a place at the modern table in the form of a communal one-pot meal, or nabemono (“things-in-a-pot”). Almost every household in Japan has at least one classic-style donabe used to cook a variety of dishes tabletop. The classic-style donabe is also ideal for stewing or braising. The importance of a good rice cooker is impossible to overstate. The bottom of this hand-fired piece is almost twice as thick as a regular donabe to allow for greater heat retention and gentle cooking. Even after the heating element is turned off, heat retained from the clay kept continues to steam-cook the rice to its perfect fluffiness. The grill body of this donabe is designed to work as a hearth, which helps to build heat slowly and prevents the grill from becoming too hot. The outer reservoir can be filled with water and act as a drip pan to collect excess fat, cooking ingredients to the desirable doneness with a minimal amount of smoke. Smoke seafood and meat to mushrooms and vegetables all at the same time with the Iga-made donabe smoker. The base and lid of the donabe become tightly sealed after pouring water around the rim, creating a steamy vessel that keeps smoke in and permeates the ingredients with flavor. Learn more about how to get started with the smoker. “Fukkura” means “fluffy” in Japanese. This versatile donabe is suitable to use to stir-fry, steam-fry, roast, stew, or smoke food. Use in hot or cold preparations, with or without its lid, either directly on the skillet or with a grate. The lid can also be used as a serving bowl for both hot and cold food. Unlike other donabe, Fukkura-san doesn’t need to be seasoned before you start using it for the first time. Once rinsed and dried, it’s ready to cook! Use the classic Iga-Yaki donabe with this dish. It’s an easy way to cook a delicious and healthy one pot meal, which you can make and serve right at the table, using whatever ingredients you might have on hand. This recipe is pretty familiar, like chicken soup! Season the chicken all over with the salt. Let the chicken marinate for 15 to 30 minutes. To make the broth, combine the chicken dashi, kombu dashi, sake, mirin, and soy sauce in the donabe and add the bottom part of the Napa cabbage. Cover and set over medium-high heat. As soon as the broth starts to boil, turn down the heat to simmer. Add the chicken and the rest of the ingredients except for the mizuna. Cover again and bring back to a simmer. Simmer until everything is just cooked through, about 3 to 5 minutes. Add the mizuna and cook for 1 minute longer before turning off the heat. Serve in individual bowls at the table with yuzu-kosho. This entry was posted in Eat Good Food and tagged donabe, hot pot, iga yaki grill, japanese housewares, recipe, rice cooker, smoker, tagine. Awesome article. I have had two of these donabes since my parents lived in Japan many decades ago and I really did not know how they were used. !!! Thank you for this post!